Asian (Elephas maximus) and African (Loxodonta) elephants. 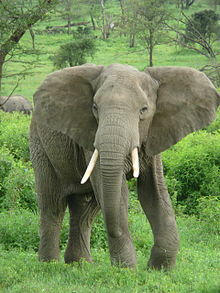 Elephants are large land mammals in two genera of the family Elephantidae: Elephas and Loxodonta. Three species of elephant are living today: the African bush elephant, the African forest elephant and the Asian elephant (also known as the Indian elephant). All other species and genera of Elephantidae are extinct, some since the last ice age although dwarf forms of mammoths may have survived as late as 2,000 BCE. ↑ Vartanyan, S. L.; Garutt, V. E.; Sher, A. V. (25 March 1993). "Holocene dwarf mammoths from Wrangel Island in the Siberian Arctic". Nature 362 (6418): 337–340. doi:10.1038/362337a0. http://blogs.nature.com/nautilus/Dwarf%20mammoths.pdf. Àtunṣe ojúewé yi gbẹ̀yìn wáyé ni ọjọ́ 14 Oṣù Kẹta 2013, ni ago 08:26.